Of all the bands I play with, or have played with, the oldest one by quite some margin is the Menai Bridge Brass Band. This year we are celebrating our 120th Anniversary (though I’ve only been playing with the band for about 2 years). We have had an excellent, if somewhat busy, year to mark this auspicious anniversary, with good results in several competitions and our first trip to the finals of the National Brass Band Championships for several years (we came 12th out of 19 bands in Section 4 but, bearing in mind that each of those bands came 1st or 2nd in their own regional contests a few months earlier, that’s not a bad result at all), as well as recording a CD (the production of which should be finished within the next few days). The other big highlight of the year is coming up in about a fortnight’s time – a concert to celebrate our anniversary. This will take place on Saturday 1st November at the secondary school in Menai Bridge (Ysgol David Hughes), a venue which should allow an audience of around 400 people. All three bands that fall under the umbrella of the Menai Bridge Band (the senior, intermediate and beginner bands) will be performing along with guest soloists, including Gwyn Owen, a former member of our band who was a finalist for this year’s Bryn Terfel Scholarship (and who I look forward to meeting, as he had left the band before I joined). As well as the music itself, there will be a short presentation about the history of the band. Apart from a break during the Second World War, the band has been running continuously since its inception, although it did dwindle to a very small size for a while in the 1960s. 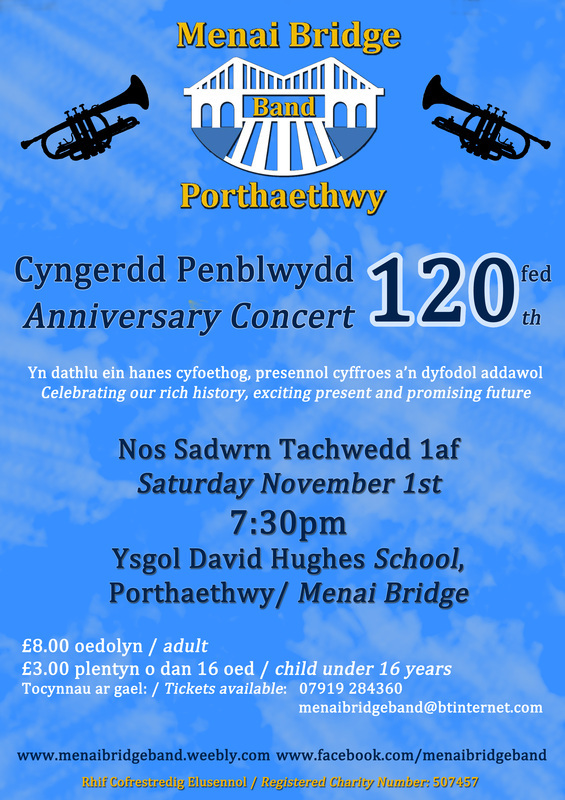 Amongst other items, the concert programme will include a waltz (“Belinda”) composed by the band’s first conductor, George Senogles, and a piece (“Pont Menai”) written for us this year by local composer Owain Llwyd to mark our anniversary, as well as selections from the Vivat Regina suite by William Mathias, who was a long-term resident of Menai Bridge and one of the foremost composers in Wales; all these are also on our CD (if you’ll forgive a swift plug; NB copies should be on sale at the concert). The intermediate band will be playing a piece that has been written (or possibly is even still being written) by its conductor, Hannah, to mark the centenary of the First World War, in which several members of our band went to fight; some of them did not return. In case you were wondering, I play with all three bands: Bb bass (or tuba to the non-brass-band world) in the senior band and trombone with the others. If you happen to be in North West Wales on 1st November you may like to consider coming along to the concert.